The concept, created and designed by ARC Event Solutions Ltd, follows five years extensive research alongside Law enforcement officers and counter terrorism experts. Our products and services have been used at a number of the following Events; Sport Stadia, Rock and Pop Festivals, Street Fairs, Protest Marches, important Political Meetings and/or for control of sensitive installations. Towable by 4×4 vehicle, deployed and ready to use in under 15 minutes. Footprint of approx 7m x 2.2m – height clearance of 3m. Ideal temporary solution for VIP Areas at, Conferences, Concerts, Hi profile Weddings and Events, Night clubs, Theatres , Arenas, Building sites , Prisons, Schools, Hospitals, Airports, Dockside, Shipping Ports, Border Control, Military Locations and Buildings, Sensitive Film studios and Locations, Buildings, requiring ARC Event Solutions Ltd and, Data collection points. 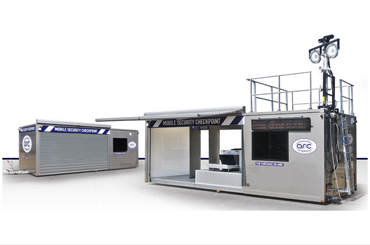 This unique and sophistacted Mobile Security Checkpoint, is available for either short or long term renatl options. Please click here here to request more details.